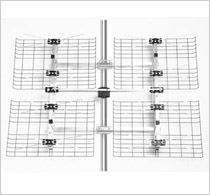 The DB-8 is one of the best performing UHF antennas currently in the market! Earn 119 SATVantage Rewards points with this purchase! Intended for people at great distances from the transmitters, the DB8 is a powerful multi-directional HD antenna. In fact, its 15.8 dBi gain make it one of the most powerful multi-directional antennas available.